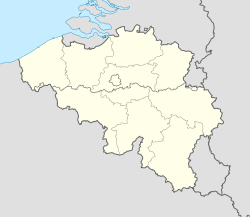 Etterbeek is ane o the nineteen municipalities locatit in the Brussels-Caipital Region o Belgium. It neighbours the municipalities o the Ceety o Brussels, Ixelles, Auderghem, Woluwe-Saint-Pierre, Woluwe-Saint-Lambert an Schaerbeek. The main campus o the Dutch-speakin Vrije Universiteit Brussel is cried Campus Etterbeek, awtho it, alang wi the adjacent de la Plaine campus o the French-speakin Université Libre de Bruxelles, is technically pairt o Ixelles. 3 Proposed redevelopment "Les Jardins de la Chasse"
Thare is a rail station cried Gare d'Etterbeek or Etterbeek-Station but, lik the Vrije Universiteit Brussel, it is locatit in Ixelles or Elsene an aw. Presently, Etterbeek haes ane rail station (Mérode) an three metro stations (Mérode, Thieffry an Pétillon). Etterbeek hosts twa fitbaa clubs (R.R.C. Etterbeek an Armenie) playin in Belgian Provincial leagues at the Guy Thys stadium, namit efter the famous Belgian manager in simmer 2003. He led Belgium naitional fitbaa team tae fowert place at the 1986 FIFA World Cup. In the simmer o 1996, the municipal soummin puil burnt doun. It haes nou been rebuilt an is again open tae the public. A project is currently proposed tae redevelop an aurie o Etterbeek near the Avenue des Casernes. This project wad result in the toun haw an polis station bein relocatit tae new biggis in a central admeenistrative centre on this steid. The new steid is bein cried the Jardins de la Chasse (French) or Tuinen van de Jacht (Dutch). Etterbeek hosts an annual medieval mercat at the end o Mey on the Avenue du 2ème Régiment de Lanciers in the sooth o the municipality. ↑ "Les Jardins de la Chasse" (pdf) (in French). Retrieved 2008-10-12. Wikimedia Commons haes media relatit tae Etterbeek.